Stress is something we have to deal with continually. 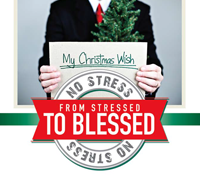 Actually, this time of year there seems to be more stress on people. But God wants to help us with our stress! If you want to fulfill God's purpose for your life, you must first understand that you have a divine destiny. You will never fulfill what you don't know you have, and you must learn to leave the past behind. Have you ever wanted a fresh start in life? Some people hope to get a new start by moving to a different city or state. They think they can erase their past failures by going somewhere new. Unfortunately, this never happens. Why? Because they take with them the same old attitudes and habits that guarantee their continued unhappiness. People don't realize that they don't have to move to start over. They can stay right where they are and receive a second chance in the midst of their failures. Every one of us desires to improve himself in one area or another. You may desire to be a better parent, a better spouse, a better employee, or just a better Christian.